Since last night I have been struggling with really slow Internet. I thought it was a virus, but have run Avast!, Malewarebytes, Windows Defender and Spybot – all are completely clean. Then my wife mentioned that Internet is slow on her PC too, so I figured it must be a connect problem. According to various speed tests, my download speed is still about 37 Mbps and upload around 10 Mbps, which is pretty normal. I just searched Google to see if other people are suffering, and they are, in their hundreds. So, it seems that I am not alone. It has been going on for more than a day already. The BT Service Status page says “We currently have 15 ongoing issues and 9 resolved issues.”, but there are many more than this being discussed. 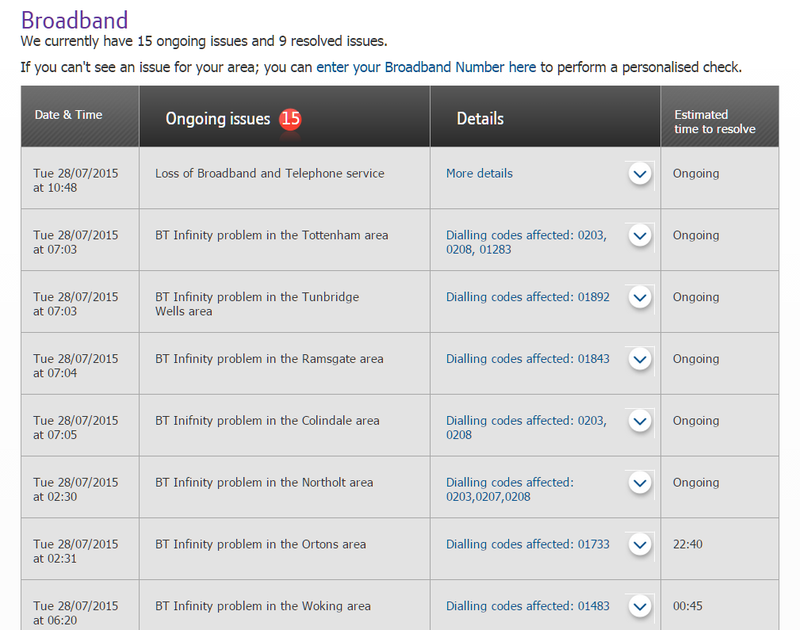 All of the issues on the page are “Loss of Broadband and Telephone service” or “BT Infinity problem in the ….”. It seems that something major is wrong with BT at the moment. Hopefully just a technical issue that can be resolved, and not an attack on the network.